With increasing demands, dwindling resources, and evaporating time, how can you deliver? Build and deploy business apps faster than you thought possible. 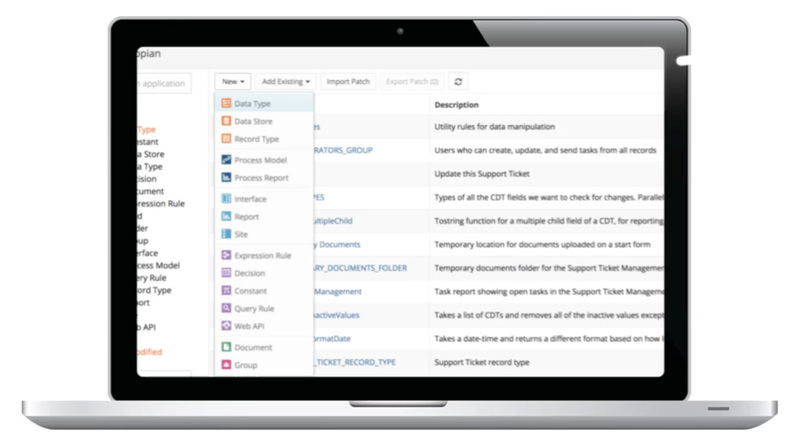 Have confidence your apps can run your most critical business processes. You don’t need to choose between speed and power. This is Appian Low-Code, included in the Digital Transformation Platform. How do you know if Low-Code is right for you? Turn a great idea into a business app in less time than reading this page. Go from idea to innovation in just three steps with Appian Quick Apps. Immediately deploy business applications across devices as soon as design is complete. Pre-built connectors and easy-to-configure APIs result in faster integration than you ever imagined. Create apps that work as expected on any device, natively with no extra time, effort, or resources. Expand your apps to address any challenge. Go beyond simple applications. 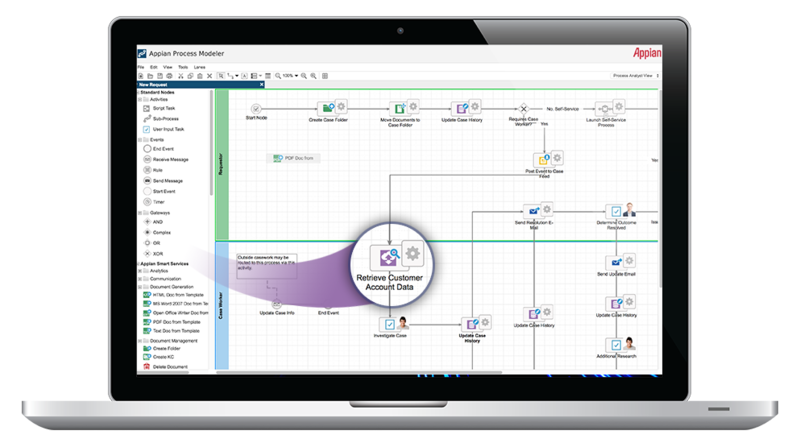 Automate even the most critical and complex processes with business process management capabilities that start with drag-and-drop process modeling. More security certifications plus proven scalability across global enterprise environments all adds up to your confidence…the second your apps are deployed. Build, use, and change business apps easier than you ever imagined. Drag-and-drop and point-and-click development tools make building and changing enterprise apps easy and fast. Patented design capabilities mean you build it once…then it just works on any device, natively, with no extra development time. Likewise, you change it? It just works….everywhere. Yes. This means virtually the same thing as what you just read. And, it’s that cool. With Appian, your apps are instantly mobile with no extra time, effort, or resources required. Apps are simple and intuitive to use, providing a streamlined experience with immediate adoption. 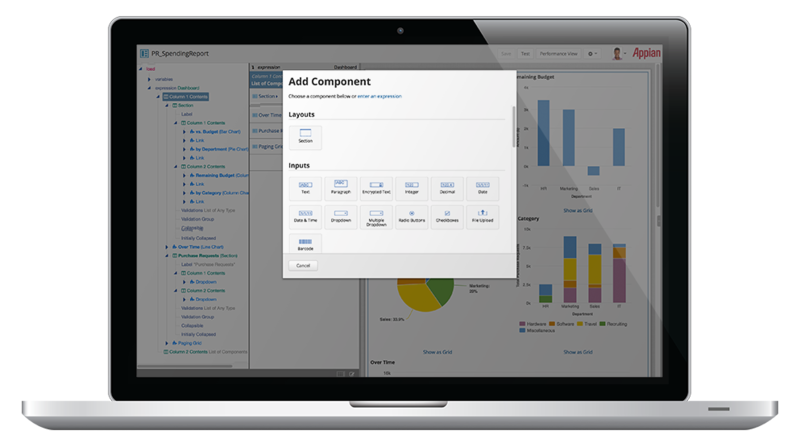 See what Appian can do for you. In the era of digital change, enterprise low-code development from Appian empowers you to be disruptive. Have a great idea? It can become reality...fast. With low-code development, IT becomes more strategic. Remove the traditional barriers between Business and IT to promote continual collaboration and improvements. Everyone has ideas. With Appian low-code development, even citizen developers can create apps that play nicely in the IT environment. Market conditions. Customer expectations. Global regulations. New technologies. They’re all continually evolving. Address the change with the flexibility afforded by low-code app development from Appian.